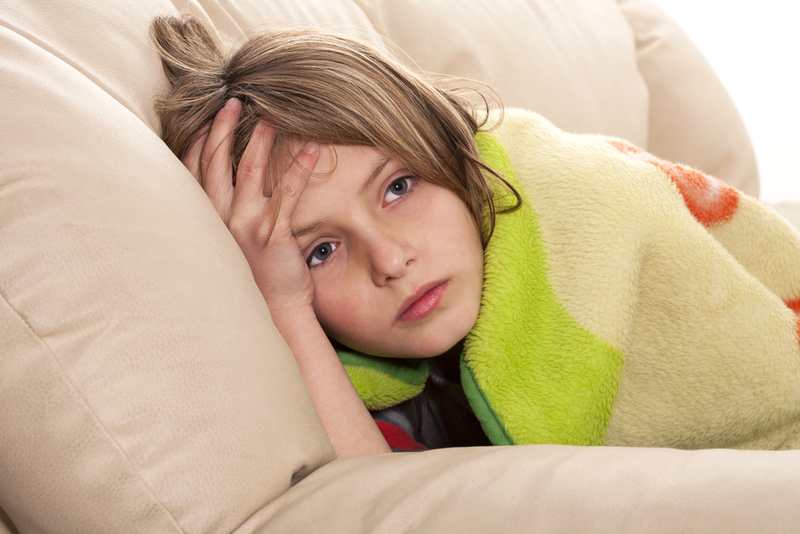 Children often complain of abdominal pains and ascertaining whether the cause is serious can be difficult. This is a common reason to seek medical advice. This article helps to decide whether the problem is severe enough to warrant a trip to the doctor. Click here to see the article on recurrent abdominal pain. The child will complain of pain, and may double over and cry, or lie quietly on the couch. The next few hours will determine whether there is a need to take this further. The cause could be as simple as an ‘indigestion like’ pain or some vague non specific gastrointestinal complaint, or the start of a more serious cause that will require assessment and possible investigation. To help decide where this pain is coming from it is important to look for other symptoms and the following is a rough guide with the most common ailments covered first. Abdominal pain is a common symptom of infections, whether specific for the gastrointestinal tract or elsewhere. Simple viruses, that cause colds and influenza will often have pains in the abdominal as part of the ‘picture’. Symptoms such as temperature, runny nose, cough and sore throat will be clues. Gastrointestinal infection will have temperature, vomiting and diarrhoea. The abdominal pains in this situation are ‘part of the illness’ and are about 5-6/10 in intensity, come and go and the child will usually be able to ‘walk and talk’. Sometimes though when they get the pains the child maybe upset and double over. These pains last for a few minutes at a time. When assessed by a doctor the tummy will appear normal when examined, or slightly tender. Appetite maybe lost or diminished. Sometimes children will become constipated and will complain of abdominal pain. Many parents will understand this and suggest to a child to ‘sit on the toilet’. This can happen due to a variety of causes, such as a briefly poor diet, being ‘too busy’ to go to the toilet, not being able to access a toilet. The pain will come and go, sometimes result in distress, doubling over and crying, followed by a period of improvement in pain before ‘indigestion’ returns. The doctor will sometimes feel that the child is constipated by feeling the abdomen and ruling out more significant causes. There will be no fever and no other symptoms. Constipation does not cause temperature, or vomiting. Other non specific causes of acute abdominal pain. In many cases the cause will not be obvious and will eventually settle. This can be confusing. Causes will be guessed and I suppose adults would label this pain indigestion. Clear fluids and time will settle these types of pains. However if they recur then this would be under the category below – recurrent abdominal pains. Many parents will be concerned about appendicitis. However this is rare in childhood, and is more often seen in the adolescent or young adult. The pain of appendicitis will gradually increase, and become constant rather than intermittent. Movement, coughing, sneezing will worsen the pain, and there may be a low grade temperature, loss of appetite and sometimes vomiting. The child will appear unwell, and will stop moving and become quiet as vocalising and crying will worsen the pain. The abdominal examination is abnormal and suggestive of something more sinister. Other serious causes will result in significant vomiting, which may be bile stained (obstruction), and the child will clearly need emergency department assessment. Serious infections and surgical causes will present in this way. Apart from the more serious causes the management is providing clear fluids, reassurance and if needed getting a medical assessment. If the child is hungry then it is highly unlikely that there is a significant cause for the abdominal pains and this is a reassuring symptom. If vomiting becomes a significant symptom with lethargy and dehydration then the hospital assessment is essential to ensure there is not a serious infection or surgical illness. For non specific causes once the pain has abated and the child appears active and hungry, gently re introducing food is appropriate.